Sigmund Freud, the founder of psychoanalysis, changed the perception of the human mind and its workings. 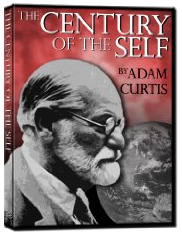 The series describes the propaganda that Western governments and corporations have utilized stemming from Freud's theories. Freud himself and his nephew Edward Bernays, who was the first to use psychological techniques in public relations, are discussed. Freud's daughter Anna Freud, a pioneer of child psychology, is mentioned in the second part, as is one of the main opponents of Freud's theories, Wilhelm Reich, in the third part. The business and political world uses psychological techniques to read, create and fulfill our desires, to make their products or speeches as pleasing as possible to us. Curtis raises the question of the intentions and roots of this fact. Where once the political process was about engaging people's rational, conscious minds, as well as facilitating their needs as a society, the documentary shows how by employing the tactics of psychoanalysis, politicians appeal to irrational, primitive impulses that have little apparent bearing on issues outside of the narrow self-interest of a consumer population. Paul Mazur, a leading Wall Street banker working for Lehman Brothers, is cited as declaring: "We must shift America from a needs- to a desires-culture. People must be trained to desire, to want new things, even before the old have been entirely consumed. [...] Man's desires must overshadow his needs". In Episode 4 the main subjects are Philip Gould and Matthew Freud, the great-grandson of Sigmund, a PR consultant. They were part of the efforts during the nineties to bring the Democrats in the US and New Labour in the United Kingdom back into power. Adam Curtis explores the psychological methods they have now massively introduced into politics. He also argues that the eventual outcome strongly resembles Edward Bernays vision for the "Democracity" during the 1939 New York World's Fair. It is widely believed that the series was inspired and informed by a book written by the American historian, Stuart Ewen, "PR! A Social History of Spin". The Century Of Self: Happiness Machines (Episode1) from Roses of Time on Vimeo. The Century Of Self: Engineering Of Consent (Episode2) from Roses of Time on Vimeo. The Century Of Self: There is a Policeman Inside All Our Heads (episode 3) from Roses of Time on Vimeo. The Century Of Self: Eight People Sipping Wine in Kettering (Episode 4) from Roses of Time on Vimeo.